Mike Bruton is one of the leading fish biologists in Africa. 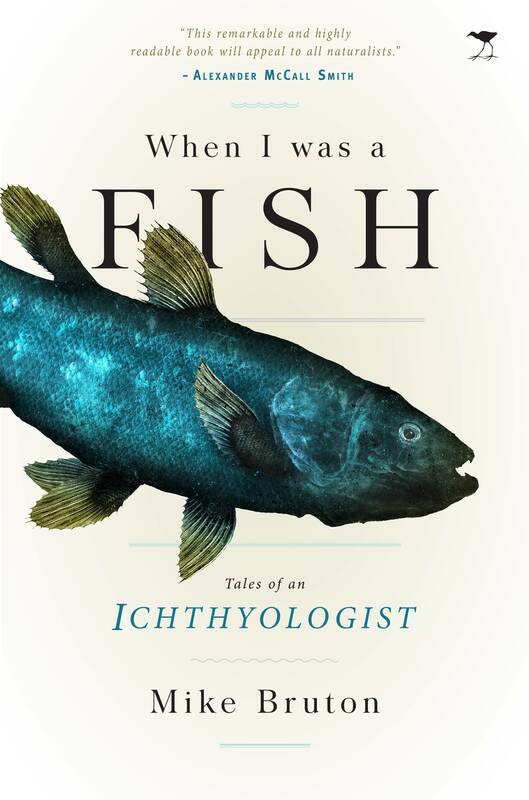 In his book When I was a Fish: Tales of an Ichthyologist he shares more about this relatively unusual career, showing that an aquatic scientist’s life is a story worth telling. At the recent launch held at the Two Oceans Aquarium in Cape Town Bruton captivated the audience with hilarious tales and interesting titbits from his wide experience. Bruton is the founder of the MTN Sciencentre in Cape Town as well as the former director of the Environmental Education Centre at the Aquarium, making it a fitting venue to launch his book. Whenever one writes an autobiography people ask, Why? Is it for vanity, or to set the record straight, or maybe even to re-write history. Or maybe it is to tell your family what you were doing when you should have been on a family holiday? I have not written an autobiography, a description of the whole gamut of your lifetime experiences, but a memoir, an intimate portrait of the memories, feelings and emotions during one part of your life. I regard it as an extension of my mission to play a role in demystifying science and making it accessible to people. For most of the past few years I have lived in the Arab world, in societies that have embraced technology but, to a large extent, rejected science, or at least major aspects of it. This made me realise that we should not take it for granted that modern, technologically advanced societies are science-based. This is a lose/lose situation as no one benefits from a mindset that undervalues science. Science is a very important part of modern society. To some it is merely the accumulation of facts, but it is much more than that. It is an effective problem-solving way of thinking that applies to all aspects of life and is fundamental to our development of an understanding of how things work. Science is also not just the aggrandisement of past intellectual accomplishments but rather an ongoing reaction against them. We don’t only advance science by “standing on the shoulders of giants”, as Newton suggested, but rather by kicking the feet from under these giants and constantly re-examining their ideas. The most significant advances in science have often been made when the “current wisdom” was unceremoniously discarded and replaced with a new (but still imperfect) understanding. I have found that the public often does not understand that it is healthy for scientists to disagree with one another and to propose alternative hypotheses for the explanation of the same set of data. We need to make it clear that good science is all about doubt, uncertainty, scepticism and testing alternate ideas, not about certainty and dogmatism. More scientific facts are now discovered in a decade than were previously acquired in a century. The challenge to science educators is to sift through the vast masses of data and communicate what is useful to people in the context of their everyday lives. Our ability to communicate science is better than ever but we tend to communicate mostly with those who know, or want to know, rather than with those who don’t want to know. Scientists and science educators need to maximize their engagement with the whole population. So I have written a memoir that provides a record of part of my scientific journey, not only the interesting people, places and events that I have encountered but also aspects of my intellectual journey as a scientist. Hopefully, with Carol Broomhall’s professional assistance, I have made it fast-paced and readable enough to hold your attention to the end. I have time here to mention just a few anecdotes from my time at this great aquarium. When Russell Upton and Lex Fearnhead first invited me to join the staff I was initially reluctant as I was happily ensconced in Grahamstown as Director of the Ichthyology Institute, Carolynn had a challenging computer science teaching post, and our kids were receiving an excellent Kingswood education. But we needed a change, and I wanted to challenge myself in a bigger pond. I joined the aquarium 11 months before it opened and, for a substantial part of that time, sat nose-to-nose at a small desk with one of the most dynamic women I have ever met, Sheryl Ozinsky, head of marketing. It was a real learning curve working that intimately with Sheryl! We formed the Two Oceans Environmental Education Trust to develop the educational programmes and I was particularly fortunate to have Justice Pat Tebbutt appointed to its board as his wise counsel helped me to solve many problems; he has remained a close friend (and drinking buddy) ever since. The goals of the trust were to develop the educational programmes and to arrange transport to the aquarium for groups of children from poorer communities. We were also tasked with developing teaching aids and educational displays, training teachers, recruiting and training volunteers, launching, together with the marketing team, the ‘Society of Friends’ and its newsletter, and developing an “Aquaclub” for junior members. We were also responsible for preparing the signage for the live displays and I was very fortunate to have on my staff Margo Branch, whose encyclopaedic knowledge of marine life and artistic skills were invaluable. We also benefitted from the expertise of her husband, George, and that of Lex Fearnhead, Pat Garratt and Tony McEwan on the aquarium staff and Alan Heydorn, a member of the scientific advisory committee. We were determined from the outset to use new and innovative ways of teaching, not only about the sea and marine biodiversity but also about the importance of water and the development of skills for sustainable living. Our repertoire included guided tours, discussions, debates, dissections, quizzes, talks, mobile displays, hands-on workshops, excursions and the implementation of practical water conservation measures in the school, home and office. During our first six months of operation 24,000 children from 330 schools took part in our educational programmes, and the numbers escalated steadily thereafter. By the time the trust was inaugurated in July 1996 we had already trained 248 volunteers who had done over 21,000 hours of service. My role also included raising funds to establish and equip classrooms and laboratories and we found willing partners in Old Mutual, the Strategic Fuel Fund, Simba, Alpha Ltd, SAPPI, Mazda Wildlife Fund, De Beers Marine, WWF-SA and others. Soon two additional classrooms were built onto the Aquarium and computer and audio-visual aids and other teaching aids were installed. Famous people: Michael Jackson. Duke of Edinburgh, oil farm cleansing using a remarkable new technique involving oil-eating bacteria, a form of bio-remediation – genetically engineered new species of the oil-eating Pseudomonas bacterium. Queen and seal, Arch Tutu. Richard Leakey, Ian Player, Lee Durrell. Robben Island Museum – environmental management plan – bicycle tours STRP of Ramsar. Actively involved regionally and internationally in fish and wetland conservation through the IUCN, WWF, Habitat Council, etc. Invited onto the STRP and charged with drawing up a new set of criteria for the designation of wetlands of international importance based on their fish and fisheries. Popular science talks, QE2 cruise. Ocean Books Agency in England – organises the speakers for luxury passenger ships operated by the Cunard Line, incl. the QE2 next voyage from Cape Town to Southampton via St Helena, Dakar, Tenerife and Lisbon. “20:20 Vision for Water” Kader Asmal and Guy Preston – school water audits. We developed a water audit resource kit, contained in a 20 litre bucket, that included all the equipment necessary to measure the amount of water that is being used, or wasted, by schools. Students were taught how to measure the water consumption of their schools, to devise methods to reduce this consumption, and then to measure how much water (and money) had been saved. We assembled over 1,500 water audit kits that were eventually used by over 600,000 learners countrywide. 1998 first “Year of S&T” travelling exhibition from la Cite. Blue Shed, interactive displays – first for SA – huge success, time extension – big impact. Travel to France, later received an award from France “for promoting links between scientists and science educators in France and South Africa”. In an unusual thank-you speech I listed the 26 things that most excite me about France, from A to Z, Arles to Zinedine Zidane. 1996 Jago dives- every great aquarium In the 1930s Barton and Beebe launched their pioneering dives in the Bathysphere to a depth of 922 m from the New York Aquarium, and public aquaria in Monaco, Monterey, Hawaii and elsewhere have all promoted deep-sea research using submersibles. The most famous research sub in the world, Alvin, is based at the Woods Hole Oceanographic Institute in the USA The TOA is no exception as, in 1996, we launched a second series of Jago dives off SA with sponsorship from De Beers Marine. Helen Lockhart and I – “Festival of Diving” – exhibition on “History of Diving”, opened by the former Chief of the Navy, Vice Admiral “Woody” Woodburne. Talks by Hans Fricke on Jago, Emlyn Brown on Waratah, ‘ Woody’ on naval clearance diving, Jaco Boshoff on maritime archaeology, Peter Sachs on salvage diving. Hardhat divers using helmets and air supplied by hand pumps from the 1870s. Hans and I – first Jago dive in shallow water (30 m) off Robben Island – witnessed amazing sight – a stately procession of west coast lobsters walking, single file, feeler-to-tail across the sand, like soldiers on parade – splendid in their orange-and-white uniforms , tails held high. When we approached – formed defensive circle with their soft tails facing inwards. Jürgen and I dived to 125 m off Olifantsbos in the CPNR – encountered ancient Pleistocene shoreline. As in other parts of the world, sea levels have fluctuated widely off the Cape of Storms. We saw giant sea urchins – 40 cm-tall, sand-dwelling sea anemones. A large rockcod with white spots darted out from behind a rock – orange jacopever watched impassively from a nearby ledge, like an underwater lizard. Throughout our 1996 dives they were our constant companions. If ever South Africa acquires a research submersible, I would call her Jacopever. Exquisite colonial seafans – gurnards with bony helmets and bright blue fins, and colourful colonies of sea anemones. In contrast to the land, in the sea most animals, at least as adults, are attached whereas most plants are planktonic and mobile. It is only in the shallows that plants are attached, as on land. As an animal behaviourist I was particularly struck by the number of symbiotic relationships that we saw, and also by the vigour of the arms race between predators and prey. We saw representatives of far more major animal groups than in any terrestrial habitat of the same size – witnessing an important component of the diversity of Table Mountain National Park in its natural environment. Previous research had revealed “snapshots” of the biota, we were seeing it intact for the first time, the equivalent of the first tentative ecological explorations of Table Mountain over 400 years ago. At 95 m a cheeky Cape fur seal peeped into the submersible window and another seal visited the sub at 170m! South of Cape Point, Hans and Jürgen saw masses of lobsters at 100m (vs 46m). Large numbers of dead turret shells amongst giant boulders. Where had they come from, and why were they there? – there were more questions than answers. End of expedition, in an extraordinary feat of seamanship, our mothership, the Zealous, lived up to her name and took us to a point in the open ocean exactly above a wreck to the west of Dassen Island that had never been positively identified but was suspected to be the Apollo Sea. A shot line was sent down and Jago descended, landing only 440 m from the wreck. During a 4 hour 38 minute dive, Hans and Jürgen filmed the name of the wreck on the bow as well as the debris field. They also observed that, although it was only two years old, the wreck was already densely colonised by moss animals, fanworms, sea fans, crabs, sharks and bony fishes (especially jacopevers). In a cabin they found a giant octopus that was so upset by their intrusion that it attacked the sub! No oil was seen leaking from the wreck. The Apollo Sea sank off Cape Town on a stormy night in June 1994. Leaking oil from the sunken vessel caused a major environmental disaster which resulted in the death of thousands of seabirds, including endangered African penguins. Coelacanth conservation: Continued work with Hans Fricke on coelacanth biology and conservation but my time at the aquarium changed my mind on one crucial issue – captive study – in book promote the idea. Initially Hans and I campaigned against coelacanths being caught and displayed in captivity as we feared that this could cause their extinction as they were known then only from SA and the Comoros. We now know that they are far more widespread and common than we previously thought and I have proposed in my book that it is time for us to display and study a coelacanth in a public aquarium. We also know a great deal more about their physiology, habitat preferences, behaviour and feeding habits and we are confident that they would survive in captivity. They are not sensitive to reduced water pressure in shallow water but they are sensitive to low oxygen and high light levels, which we can cater for. The biggest challenge will be transporting them from the capture site to the host aquarium but I am convinced that the expertise is available to do this. This is one of the next great adventures in South African ichthyology. In so doing we will further strengthen our science culture and ensure that everyone places a greater value on science. Ultimately that is one of the most important things that we can do. Mike Bruton attended the launch of Operation Lock by John Hanks at the Book Lounge last night. In the Q&A session, he pointed out that the fate of whales had been significantly altered when a synthetic substitute had been found. This reduced the hunting of whales. He wondered aloud if there could be a similar discovery with regard to rhino horn. Sadly not, according to Hanks.